How do I run Redis on Windows? The Redis download page just seems to offer *nix options. Can I run Redis natively on Windows? Edit: For the latest versions of Redis for Windows look at MSOpenTech/redis. See Todd Menier's answer for more information. If you want to install MSOpenTech's latest port of Redis, on a Windows server, watched over by a Windows Service, without having to build anything yourself, read on. So far the RedisWatcher is not carried over to 2.6. However this should not be affected by the Redis version, and the code in the 2.4 branch should work with the Redis 2.6 binaries. Run InstallWatcher.msi. This should create a Windows service called Redis watcher. Open up the Windows Services console and start the Redis watcher service. (optional) RedisWatcher should have installed to C:\Program Files (x86)\RedisWatcher. There you'll find a config file called watcher.conf, which you can edit to set up additional instances, use different paths than I specified in steps 2 & 3, etc. You will not need to restart the service for changes to take effect. The most updated (only few minor releases behind) version of Redis can be found here. This repository provides you with 3.2.100 version (current is 3.2) whereas the most upvoted answer gives you only 2.4.6 version and the last update to the repo was 2 years ago. 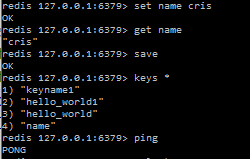 The installation is straightforward: just copy everything from the archive to any folder and run redis-server.exe to run the server and redis-cli.exe to connect to this server through the shell. 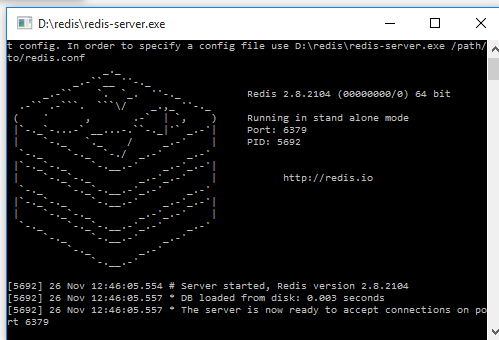 Maybe its a little Late but, I was able to run Redis on Windows 10 Aniversary Update. Windows 10 Aniversary Update Comes with Bash on Ubuntu on Windows, simply, it comes with bash. Below is the image of running Redis. This must be the first argument on the redis-server command line. Arguments after this are passed in the order they occur to Redis when the service is launched. The service will be configured as Autostart and will be launched as "NT AUTHORITY\NetworkService". Upon successful installation a success message will be displayed and Redis will exit. This command does not start the service. From what I can gather, this appears to be the new way forward rather than messing with a separate Windows service to monitor and restart the CLI. MS Open Tech recently made a version of Redis available for download on Github. They say that it isn't production ready yet, but keep an eye on it. I don't run redis on windows. There's too much hassle involved in keeping up with the ports, and they lag behind redis-stable by a version or two all the time. Instead I run redis on a Vagrant virtual machine that runs redis for me. I've bundled up the whole thing into a simple github repo so everyone can get in on the fun without too much hassle. The whole thing is an automated build so there's no mess. I blogged about the details here. If you're happy with a bit of Powershell, you can also get very up-to-date Windows binaries using Powershell and chocolatey. Windows PowerShell Copyright (C) 2013 Microsoft Corporation. All rights reserved. PS C:\windows\system32> choco install redis-64 Chocolatey (v0.9.8.27) is installing 'redis-64' and dependencies. By installing you accept the license for 'redis-64' an d each dependency you are installing. This will launch a new Ubuntu VM instance inside Virtual Box that will automatically install and start the latest stable version of redis. The Redis download page now has links to some unofficial Windows ports. The dmajkic one seems to be the most popular/complete. you can install Redis by following this article: https://github.com/ServiceStack/redis-windows but for going straight, you can download it by this link: https://github.com/ServiceStack/redis-windows/raw/master/downloads/redis-latest.zip after downloading, go to the directory which you like to put your files,then extract the zip file, then open a command prompt and go to the directory where you extracted your file, then type "redis-server" and hit enter(for opening redis-cli open command and route to redis directory, but instead of "redis-server" execute "redis-cli"). Use Vagrant to run the latest stable version of Redis inside a VirtualBox VM. You can try out baboonstack, which includes redis and also a node.js and mongoDB version manager. And it's cross platform. Redis runs slower on a VM. Virtualization toll is quite high because for many common operations. (...) Prefer to run Redis on a physical box, especially if you favor deterministic latencies. On a state-of-the-art hypervisor (VMWare), result of redis-benchmark on a VM through the physical network is almost divided by 2 compared to the physical machine, with some significant CPU time spent in system and interruptions. You can skip several steps if you have an up-to-date environment. Since MSOpenTech's port of Redis is no longer maintained - anyone interested in native port of Redis for Windows can now get the "alpha" version of Redis 4.0.2 for Windows from here: https://github.com/tporadowski/redis/releases. This fork is a merge of latest 3.2.100 version from MSOpenTech and 4.0.2 from antirez/redis with a couple of bugfixes. Currently that port has no module support and dependencies are still to be updated to what Redis uses. Says that he will maintain both 2.8. * and 3.0. * branches. You also might find this post useful to get started with basic commands. The Redis project does not officially support Windows. However, the Microsoft Open Tech group develops and maintains this Windows port targeting Win64. Not the answer you're looking for? Browse other questions tagged windows redis or ask your own question. 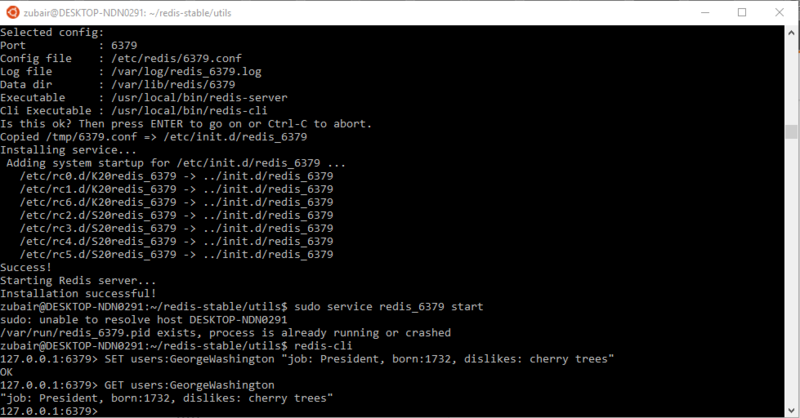 is Redis stable on Windows? Which is the “official” Redis port for Windows? Where can i get redis installation for window?